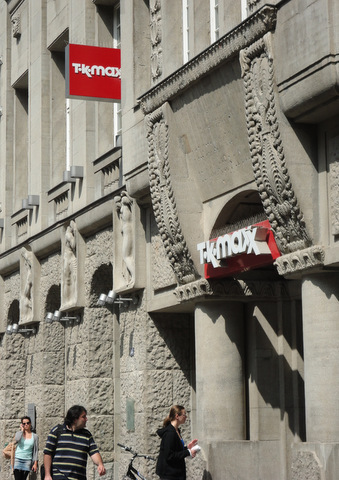 This is the last installment of fashion reports from my recent trip to northern Europe. Naturally I saved the best for last! Many tourists forgo the port city of Rostock, preferring instead to travel six hours by train into Berlin. Yeah, Berlin would have been exciting, I’m sure, but we decided to make the most of our time in Germany by staying put in Rostock and hoping for some good shopping. We were not disappointed! Next we found The Shoe Store and all bets were off. After one look at the shoe display outside the store, we were hooked, and it didn’t take me long to feel OK about spending hundreds and hundreds of dollars on shoes when they’re well made and just so dang fun! 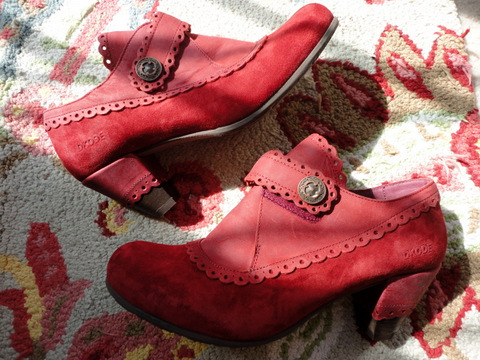 Here’s what I ended up buying: A pair of red Dkode brand shoes, made in Portugal. 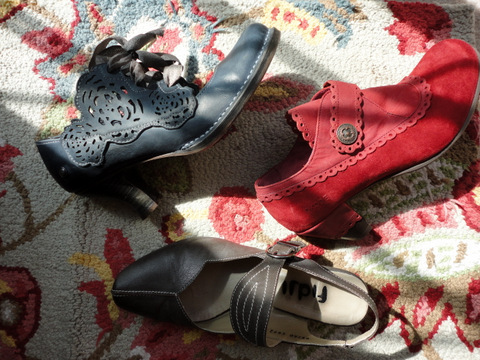 Dkode shoes are full of fun embellishments, from the suede trim and funky buttons, to the quirky patterns on the soles. I thought for sure Abby would love these the most (her fave color is red), so I essentially bought them for her. You can find Dkode shoes on Sarenza. 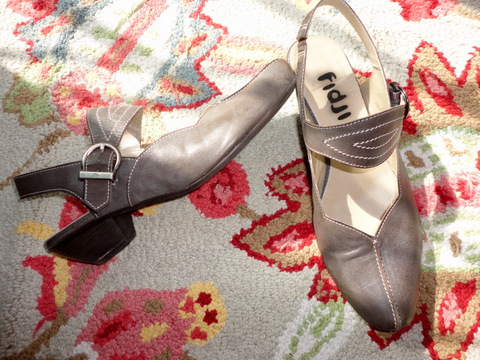 I couldn’t resist these grey shoes from Fidji, another brand from Portugal. 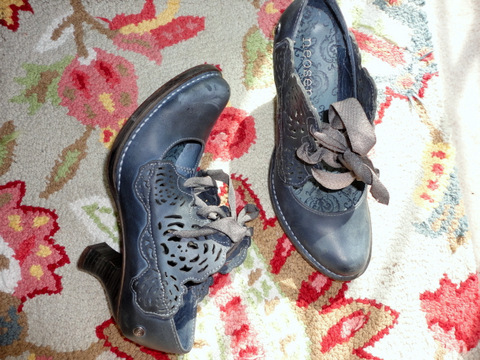 I was completely smitten by the exterior stitching, scalloped top and low heel, not to mention the color. You can find some Fidji shoes at Nordstrom, but you’ll have better luck shopping Zappos. And what’s not to love about these crazy Baroque-style shoes? I couldn’t resist the cutout pattern, ribbon ties and sassy heel. Turns out, Abby liked these best, so they’re now a share item. (I couldn’t give them up completely, and we do wear the same shoe size….) You can find some Neosens shoes, which are made in Spain, at Sarenza. Somehow we managed to find time to enjoy a cappuccino, eat lunch and have a few beers at the Rostock Brewery. Their Radler (mix of German beer and sparkling lemon soda) was exceptional. Though a Radler is designed to be a thirst quencher, we must have been really thirsty because it took a few before we felt satisfied! 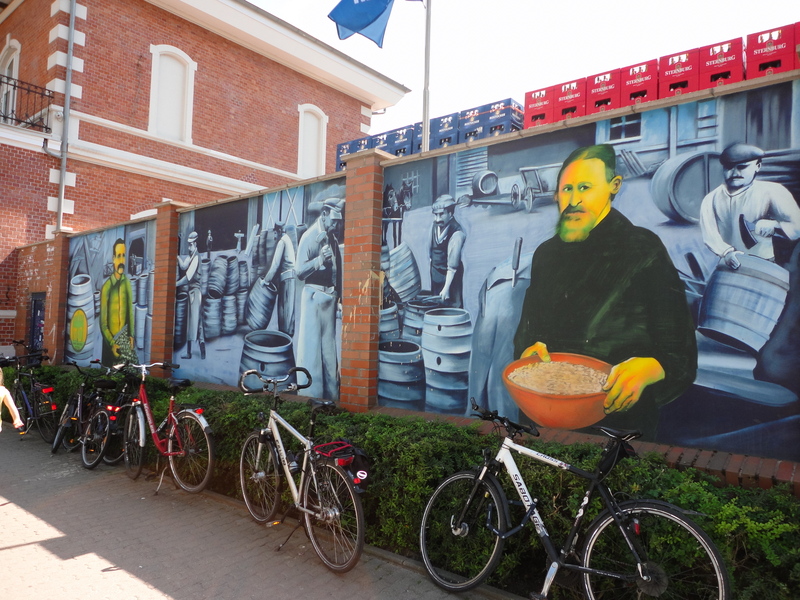 Outside the Rostocker Brewery in Rostock, Germany, where a glass of beer cost only one Euro! We also stumbled upon a music and fashion festival, and spent some leisurely time sitting on the dock, surrounded by our many packages, and contemplating our good luck by staying in Rostock. PS: If you like this post, please sign up for our automatic email updates, to the right. We never share your information, and you’ll hear from us only when we post something new, which is about once a week. Thanks for reading and commenting! ← Local Artist’s Fiber Fantastic Shawls: Learn Where to Get Yours!